Accueil » The White dress! cheveux au vent et pieds dans l’eau! Shooted on one of my favorite beaches “Plage de la Seguia” in Djerba island, Tunisia. I’m wearing a white dress from tosave.com and a bikini from GetSalted. 6 heures du mat, session photo avec Alenka, une photographe d’Australie. Shooté sur une de mes plages favorites “Plage de la Seguia” à Djerba, en Tunisie. Je porte une robe blanche de la boutique en ligne tosave.com et un bas de maillot de la marque GetSalted. Love the dress! And the pictures too! Such an amazing post! Loved all the photos! Such a pretty dress! Amazing capture babe! The beach is always a perfect place to take pictures and your outfit is also gorgeous! That dress is amazing! I need it! I love how you styled it for the beach. That’s a cute dress. I bet it’s really light and airy, which is perfect for hot summer days! I love this cover up!! It’s a little scandalous as well as simple! You are gorgeous! And I love the dress. Beach photoshoot always have such a beautiful outcome. I love your swimsuit cover up! It would be perfect for a day at the beach, and then wearing it to get food afterward! I love everything white and airy. I’m actually doing a wardrobe clothing overhaul and I want to stick to whites, light blues and a few navys thrown in. This had some great suggestions for white dresses. Gorgeous dress and sunglasses! Love your pictures! 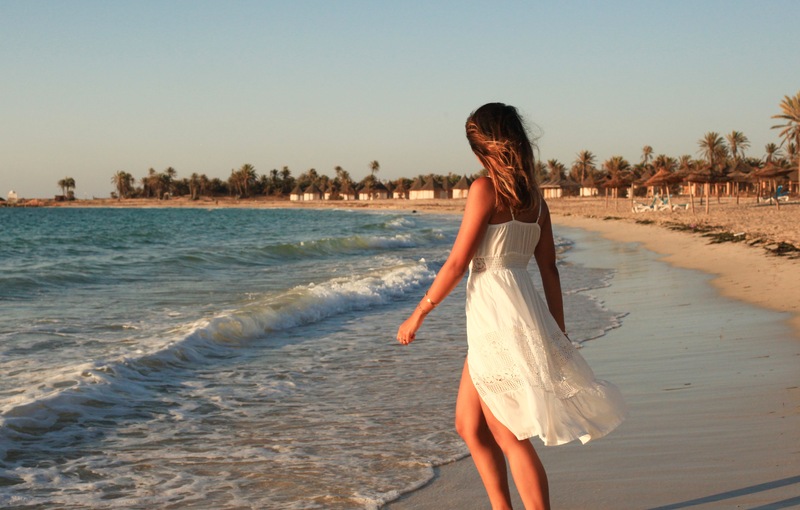 Loving this free flowing, romantic beach dress. It looks so pretty on you! Le cadre est superbe et j’aime beaucoup ta petite robe.